Eco-friendly - safe – ease of use! 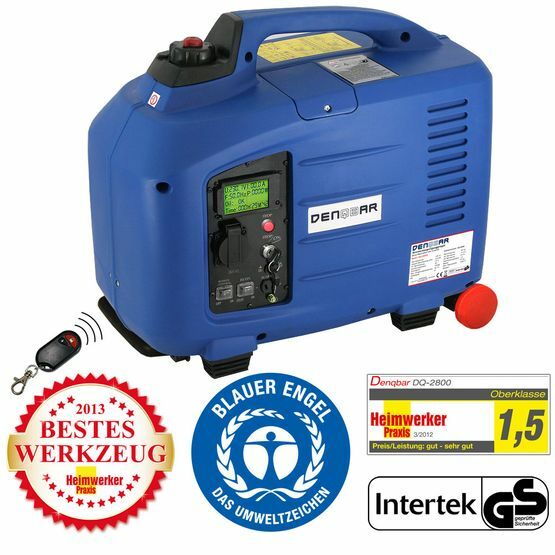 With the DQ-2800ER inverter power generator, we offer a powerful and robust product not burdening the environment which is verified by the quality seal “Blauer Engel”. Trust us and try it safe with our one-month revocation offer. However, we are sure that this model will capture your heart immediately. Datasheet of the DENQBAR Inverter power generator DQ-2800ER to download. Nowadays, of course, everybody wants to use their electrical devices en route. With the incredibly handy generators by DENQBAR no problem at all. As a manufacturer, one of our main priorities was to move our generators without much effort. In addition to especially lightweight materials, we consistently focus on handy designs. Due to the transport wheels and the extendable handle, it is as easy to move as a trolley suitcase. With this mobile inverter power generator, you will always have a reliable power supply wherever you are. The pictured federal environmental symbol "Blue Angel" (German Ecolabel) was awarded to DENQBAR Inverter power generators as proof of its special environmental friendliness. The "Blue Angel" is the first and oldest environmental protection label in the world and was launched in 1978 by the environment ministers of the federal and state governments. The inverter power generator DQ-2800ER was not only convincing low noise emission values, but also the low waste gas emissions contributed to the awarding of the coveted Federal Environmental Seal. The "Werkzeug des Jahres 2013" award is given to products that have been subjected to the critical and transparent tests of the jury of the magazine "Heimwerker Praxis" and proved their value. From this selection, the readers of the trade magazine then chose their "Werkzeug des Jahres" (tool of the year). Therefore, this is the sign of quality and customer satisfaction of the awarded products. The independent trade and test magazine Heimwerker Praxis certifies a high-quality standard for the DENQBAR inverter power generator DQ-2800ER and rated it with the overall grade of 1.5. Especially in price-performance-ratio, the mobile power generator has performed well / very well. "A very good generator that is easy to move and easy to use." is the conclusion of Heimwerker Praxis. "Geprüfte Sicherheit" (Tested Safety) - The GS mark confirms this product to be safe, legally valid and of high quality. We have voluntarily subjected our product to a stringent quality control by an independent licensed notified body. This certification has been awarded by Intertek with the Certificate No 17SZS1883-01. Romantic sunsets, a gentle breeze in your hair, secluded anchor bays or watching the exotic marine life - sailing is trendy. It is stated, that time on the vast seas of the world opens your mind and makes you feel at ease. Especially on long-term trips, every sailor should have a self-sufficient power source, for example a reliable inverter power generator from DENQBAR! Thus, even in emergency situations, such as a power outage, the vital communication with the outside world is guaranteed. The full 2800 Watts maximum power, long service life and easy starting - all these characteristics represent our DQ-2800ER. As well we have further increased the safety factor in all our mobile power generators: A special automatic shut-off protects the device in case of oil shortage or overload. With the integrated battery for the electric start and the useful radio remote control, handling the DQ-2800ER is extremely comfortable. The quiet operation of this digital inverter power generator is excellent. In the category "Low Noise", the Inverter DQ-2800ER power generator, as well as our entire 2800 Watts series, was awarded the federal environmental label "Blue Angel". Since 1978, this seal is a guarantee for a special environmental friendliness.